Cyclic nucleotides can relax vascular smooth muscle by mechanisms distal to myosin regulatory light chain (MRLC) phosphorylation. This mechanism, termed relaxation without MRLC dephosphorylation, may be regulated by ser16 phosphorylation of heat shock protein 20 (HSP20). Confocal imaging of HSP20 in smooth muscle tissues revealed that HSP20 was present throughout the cytoplasm, although some focal regions of the cytoplasm were found to contain more HSP20 than the remaining cytoplasm. The distribution of HSP20 within the cytoplasm was not altered by histamine, forskolin, or nitroglycerin. Cytoplasmic localization of HSP20 is consistent with a potential function of HSP20 as a regulator of smooth muscle contractile force. In general, contractile stimuli induce smooth muscle contraction by increased myoplasmic [Ca2+], activation of myosin light chain kinase (MLCK), and phosphorylation of myosin regulatory light chains (MRLC) . Phosphorylation of MRLC on ser19 allows the muscle filaments actin and myosin to interact and form cross-bridges, thus generating contraction . In most cases, smooth muscle relaxation proceeds via a reversal of this contraction process: withdrawal of myoplasmic [Ca2+], inactivation of MLCK, and MRLC dephosphorylation . Cyclic nucleotide induced smooth muscle relaxation appears to be more complex. When submaximally stimulated swine carotid artery was treated with nitroglycerin, the relaxation was associated with reductions in myoplasmic [Ca2+] and MRLC phosphorylation . Cyclic nucleotides are known to reduce myoplasmic [Ca2+] by multiple mechanisms (reviewed in ). However, when maximally stimulated swine carotid artery was treated with nitroglycerin, stress decreased significantly, but myoplasmic [Ca2+] and MRLC phosphorylation only transiently decreased so that sustained values did not significantly differ from levels observed in maximally contracted tissues . This phenomenon is termed relaxation without MRLC dephosphorylation, and has been observed with activators of guanylyl cyclase, such as NO, and with phosphodiesterase inhibitors that increase intracellular [cGMP] . Recently, cAMP- and cGMP-dependent relaxation was found to associate with phosphorylation of heat shock protein 20 (HSP20) on ser16[7–9]. We found that a peptide from HSP20 had a sequence homology with troponin I, and that this peptide bound to thin filaments and relaxed skinned smooth muscle . We hypothesized that binding of ser16 phosphorylated HSP20 to the thin filament was responsible for relaxation without MRLC dephosphorylation. If HSP20 regulates contraction by binding to thin filaments, then HSP20, at least during cAMP or cGMP induced relaxation, should colocalize with thin filaments. We therefore evaluated the intracellular localization of HSP20. If HSP20 regulates contraction by binding to thin filaments, then HSP20, at least during cAMP or cGMP induced relaxation, should colocalize with thin filaments. In 10 μM histamine and 10 μM nitroglycerin treated swine carotid artery, confocal HSP20 immunostaining was present throughout the cell, however, there were some regions with more intense staining (Fig. 1). Intracellular localization of HSP20 in swine carotid arteries. 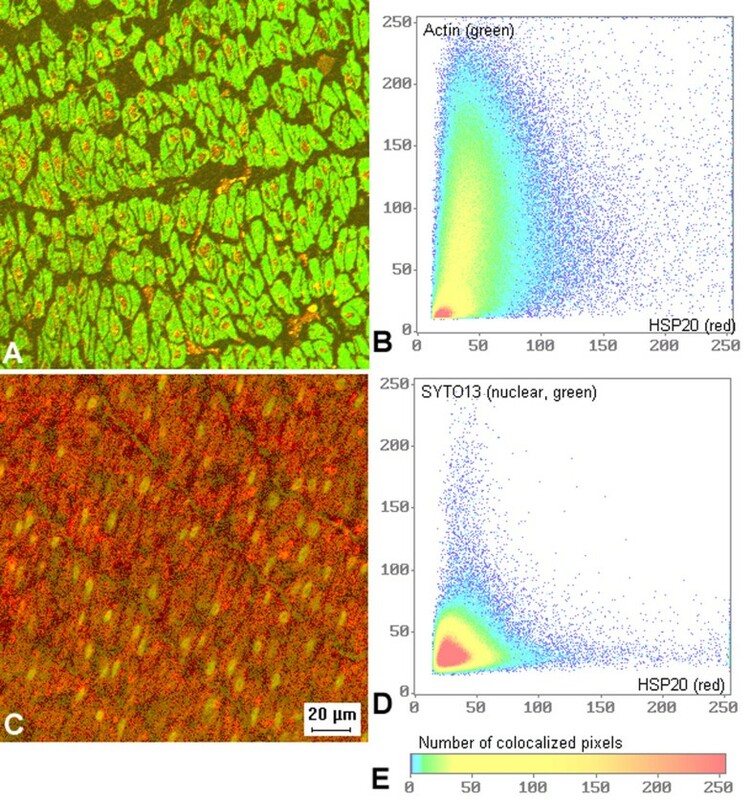 Representative cross-sectional (top) and longitudinal (bottom) confocal micrographs showing the distribution of HSP20 immunostaining in 10 μM histamine and 10 μM nitroglycerin treated swine carotid artery. Orientation refers to the long axis of the cells. The image is 160 microns wide. The micrographs show that HSP20 immunostaining was present throughout the cell, however, there were regions with more intense staining. Colocalization analysis revealed that HSP20 staining did not colocalize with the nuclear stain SYT013 (Fig. 2, bottom). These data suggest that HSP20 is primarily a cytosolic protein. Colocalization analysis comparing actin and HSP20 was more complex (Fig. 2, top). Most pixels that stained for actin also stained for varying amounts of HSP20. There were only a few pixels that stained only for HSP20. These data suggest that HSP20 is partially colocalized with actin in the cytoplasm of swine carotid artery. Co-localization of HSP20 and actin but no co-localization of HSP20 and STY013, a nuclear stain, in swine carotid arteries. A (top left). Representative micrograph shows partial co-localization of actin (green) and HSP20 (red). B (top right). An colocalization plot of staining intensities is shown at right and some regions containing HSP20 (horizontal axis) also contained actin (vertical axis). The presence of pixels in the center and upper right comer indicates that some of the HSP20 and actin colocalized. C (bottom left). Representative micrograph shows no co-localization of STY013, a nuclear stain (green) and HSP20 (red). D (bottom right). A colocalization plot of staining intensities is shown at right and demonstrates that regions containing HSP20 (horizontal axis) staining did not stain for the nucleus (vertical axis). E. Reference for colocalization plots; color indicates number of colocalized pixels. Since these studies were performed on intact smooth muscle tissues with high concentrations of HSP20 and actin, imaging would not be expected to detect individual filaments. Each image is 190 microns wide. Activation of some regulatory proteins (e.g. protein kinase C and rhoA) induces their redistribution in the cytoplasm [12–14]. Fig. 3 shows confocal HSP20 immunostaining in smooth muscle tissues. There was no apparent intracellular redistribution of HSP20 induced by stimulation with histamine or relaxation of histamine stimulated tissues by nitroglycerin or forskolin. Lack of stimulus dependence of HSP20 localization in swine carotid arteries. 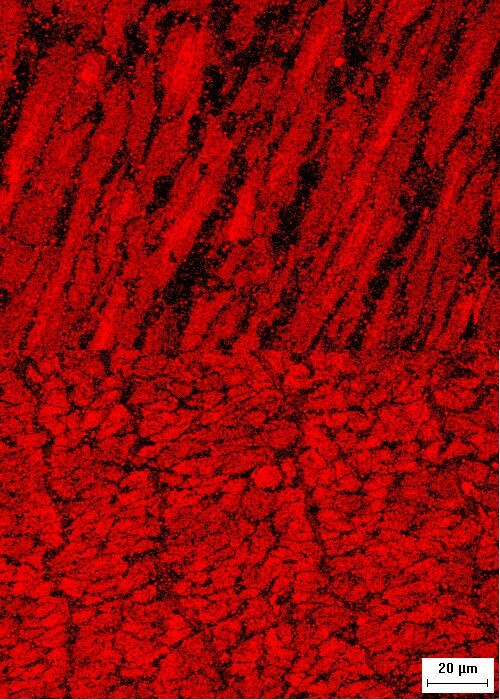 Cross-sectional representative confocal micrographs showing the distribution of HSP20 immunostaining in swine carotid artery that was A) unstimulated (top), B) treated with 10 μM histamine for 30 min (second from top), C) treated with 10 μM histamine for 30 min with 10 μM nitroglycerin added for the last 20 min (third from top), and D) treated with 10 μM histamine for 30 min with 10 μM forskolin present for the last 20 min (bottom). The image is 140 microns wide. 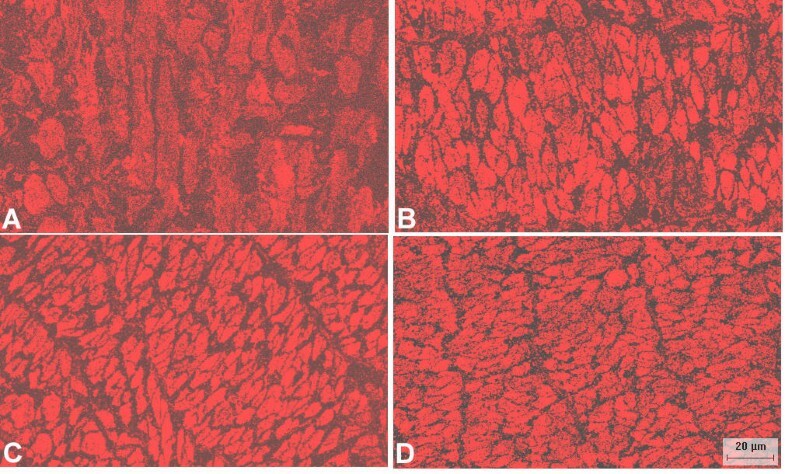 The micrographs show that the distribution of HSP20 did not appreciably change during histamine stimulation or relaxation induced by nitroglycerin or forskolin. Overall, these data suggest that HSP20 is a cytosolic protein that does not significantly translocate during cyclic nucleotide-induced relaxation. Localization studies cannot prove that a protein is physiologically relevant. However, cytosolic localization HSP20 would be required if HSP20 were to regulate smooth muscle contractile force by binding to thin filaments. Further studies are required to prove that HSP20 phosphorylation is the mediator of relaxation without MRLC dephosphorylation. Swine common carotid arteries were obtained from a slaughterhouse and transported at 0°C in physiological salt solution (PSS). PSS contained (mM): NaCl, 140; KCl, 4.7; 3-[N-morpholino] propane sulfonic acid (MOPS) 5; Na2HPO4, 1.2; CaCl2, 1.6; MgSO4, 1.2; D-glucose, 5.6; pH adjusted to 7.4 at 37°C. Dissection of medial strips, mounting and determination of the optimum length for stress development at 37°C was performed as described . Recombinant HSP20 was made in BL21 bacteria from a human HSP20 clone (B53814) obtained from the EST collaboration. Gel purified HSP20 was provided to a commercial vendor who injected a rabbit to make anti HSP20. Sequence of HSP20 was confirmed by mass spectroscopy. After confirmation of an antigenic response, serum was collected and frozen for further use. Prior studies showed that preincubation of the HSP20 antibody with recombinant HSP20 abolished immunstaining of a blot containing swine carotid HSP20 . After appropriate pharmacological treatment, swine carotid artery tissues were fixed in 4% para-formaldehyde in PBS (pH 7.0) at 4°C for 2 hours. Tissues were washed three times in PBS for 30 minutes each, dehydrated in an ascending series of ethanol (30%, 50%, 70%, 85%, 95%, and 100%), infiltrated into Technovit 7100 (Heraeus Kulzer GmbH, Wehrheim, Germany) over night, and embedded in Technovit 7100 at room temperature. Semi-thin sections (2–3 μm) were prepared using a LKB Rotary retracting microtome with glass knives. The slide was blocked with 1% BSA in PBS for one 1 hr and then incubated with anti-HSP20 diluted at 1:125 in the blocking solution over night at 4*C, washed with PBS three times of 5 minute each, incubated with CY3-conjugated anti-rabbit IgG (Sigma) diluted at 1:250 for 2–4 hours at room temperature, washed with PBS three times of 5 min each and mounted in Gel-Mount (Fisher) medium. Photographs were taken with an Olympus Flowview confocal microscope. The authors would like to thank Marcia Ripley for technical support. Smithfield of Gwaltney, Smithfield, VA donated the swine carotid arteries. Grants from the Mid Atlantic American Heart Association and the Jeffress Trust supported this research.